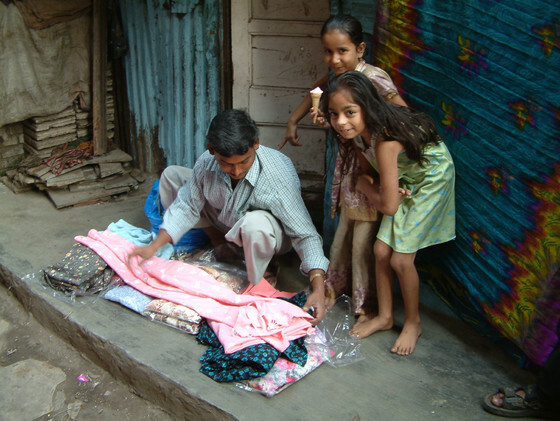 Hasan works as a cloth vendor in an Asian slum, just like this man. It was hot. Summers always were. Sweat beaded on Hasan’s brow and mingled with the dust from the street. The smells of human feces, unwashed bodies and rotting garbage filled the air, blending into a foul and ever-present stench. Life in the slum had its challenges. As Hasan shouldered his burden once again—feet protesting, back aching—he prayed, asking God to provide him with a bicycle. Hasan was a cloth vendor. After purchasing bundles of clothes, sheets and other cloth items from wholesale retailers, the young father carried them from shanty to shanty, praying people would buy enough for him to make a profit and feed his family; he had a wife and five children depending on him. But it was hard work. A bundle of clothing isn’t normally very heavy until you walk with it kilometer after kilometer after kilometer, day after day after day. Sometimes the pain in Hasan’s feet and legs became too severe for him to handle. When that happened, Hasan stayed at home—a small, thatched shanty—unable to work until he recovered. But Hasan had hope, even in the midst of these trials. Hasan knew Jesus, and he knew Jesus loved him. Hasan and his family regularly gathered to worship Jesus with many other Christians from their slum. As he prayed and asked for prayer, Hasan had hope that, somehow, God would provide for his needs. One day Hasan’s pastor, GFA supported pastor Peter, received happy news: He would be able to host a Christmas gift distribution for people in need living in his area, both Christians and non-Christians alike. As he prayed about who to give a gift to, Hasan came to mind. Two months later, in February 2014, joy overwhelmed Hasan when he received a bicycle. He didn’t have enough words to express his gratitude. His profits increased almost overnight. 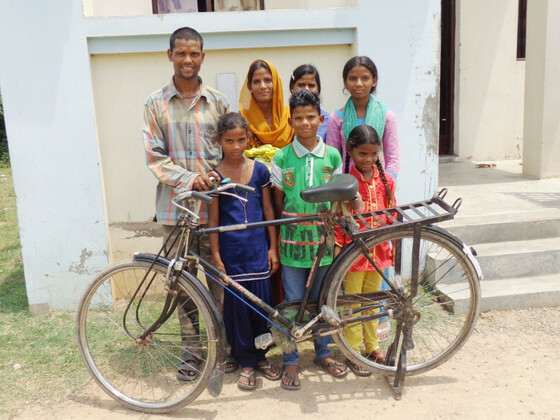 Hasan and his family with his new bicycle, a gift from GFA’s Christmas Gift Catalog. Where he could only travel to two or three villages each day on foot before, now he could visit several more. As someone who knocks on doors daily to sell his products, the bicycle really helped him meet more potential customers every single day, and that made a difference. The pain in Hasan’s legs vanished. He started providing nutritious food for his children and sending them to a better school. He purchased a plot of land to build a proper home on, so soon his family will be able to leave the slum life behind them. Through the years, the workers we support on the field have come to recognize the humble bicycle as one of the greatest gifts they can give to a poor, laboring family. While many of the bicycles, provided for through donations to GFA, go to help missionaries and pastors, every bicycle serves to help more people understand the love of Christ and help those in need. Gifts like these also bless local congregations, because when someone increases their profits, they also increase the amount they can give back to the local body. Hasan has been walking with Jesus for 11 years now, and this bicycle is a physical reminder and testimony of the Lord’s faithfulness. To see his prayers answered has only served to strengthen his understanding of the great love of God—and it helps Hasan bring his youngest two children to church, too! Whenever someone asks him about his bicycle, Hasan is able to share with them about the God who answered his prayers. Thank you for being part of more stories of transformation and for helping us to share them.